Electrical Problems? Call Us for Repairs & Installations! The Electricians and Company Inc. makes sure that power is available when you want it. If there are system issues, we make the necessary electrical repairs to correct them. We also provide fire alarm installations and much more to make your facility safe and fully operational. We have 40 years of experience, so depend on us for the highest quality commercial electrical work. There could be any number of reasons for your electrical system problems. Whether you need wiring or upgrades, we have the experience to do the job effectively. Prevent fires at your place of business with alarm installation and maintenance from our team. Service contracts for fire alarm systems are available, along with smoke detector sensitivity testing and monitoring to fire departments or central stations via phone (master box or wireless as required by authorities). We are known for quick responses and attention to scheduling and detail when working with local fire departments. 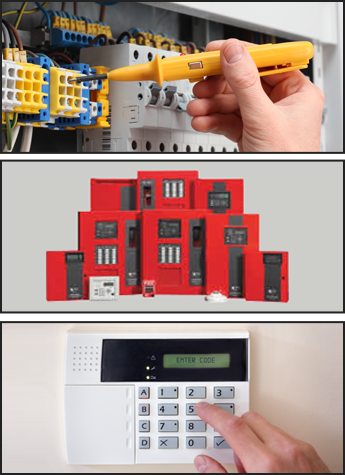 We install and monitor burglar alarm systems throughout the region, and we are a Licensed Security Service Contractor. Let us help you maintain a secure environment in a world of unknown events. Burglar alarms and camera systems have the ability to be connected to the Internet. Maintain your parking lot and commercial pole lighting with the aid of our 55-foot international bucket truck. Using our bucket truck, we can also reach building lighting that a ladder can't reach. Bucket truck service is also available for design and retrofits of LED products.